ENGLEWOOD, Colo., June 5, 2018 /PRNewswire/ -- As the world looks toward Russia, fans who want to experience "fútbol como debe ser" (soccer as it should be) will be tuning in to DishLATINO. The top pay-TV provider of content in Spanish and English is combining industry-leading technology with exclusive on-the-ground coverage by its popular spokesman Eugenio Derbez, giving fans an unparalleled tournament experience. "As our new TV campaign vividly portrays, our goal is to deliver 'fútbol como debe ser,' both through the technology we offer and the entertainment we provide, including an exclusive view of the scene in Russia through the eyes of Eugenio Derbez," said Alfredo Rodriguez, Vice President of DishLATINO. Following are key ways DishLATINO is connecting viewers to the tournament. Not every fan can make it to Russia for the tournament, so actor, director and producer Eugenio Derbez will bring the Russia experience to them in a series of comedic digital videos with DishLATINO. For the last 20 years, Derbez has been known in his home country of Mexico for his colorful coverage of major sporting events, and this is the first time since 2012 that he will reprise his role, this time bringing his sketches to viewers in the United States. While the content of the videos is under wraps, viewers can expect to see Derbez as a "correspondent" from Russia, while also providing a glimpse into how he and his fellow fútbol fans are celebrating the tournament. Starting June 15, viewers can follow along on his Facebook, Instagram and Twitter pages, as well as the DishLATINO Facebook page. To kick things off, Derbez made a video of his preparations to take on Russia, available here. Keeping track of all 64 matches can be overwhelming, but with Zona Fútbol, DishLATINO's exclusive app available on the Hopper, Joey and Wally receivers, fans can find, watch and record games more easily than ever. For example, fans can record all games in the tournament with a single click or select and record only those games played by their favorite teams, an especially useful feature for U.S. viewers given the time difference in Russia. Fans can also view team scores and stats and keep track of the schedule through a bracket that is updated in real time. To ensure fans won't miss a minute of the action, DishLATINO also delivers a split screen view of two games at once. Additionally, with the DISH Anywhere app and DISH's state-of-the-art Hopper connected to the Internet, fans can take their TV with them on the go, streaming all their live and recorded games to a phone, tablet or computer. "For the next month, our customers will be planning their calendars around one thing: the tournament schedule," said Rodriguez. "To ensure they don't miss a second of the action, we developed Zona Fútbol, and together with DISH Anywhere, these apps make DishLATINO the provider of choice for fans who want to maximize their tournament viewing experience." More information about Zona Fútbol, DISH Anywhere, and the additional features DishLATINO offers can be found here. In advance of the tournament, DishLATINO is energizing fans with a new TV campaign capturing the rich culture surrounding fútbol. The spot kicks off with a single drumbeat, and viewers are immediately taken on a fast-paced ride into the passionate world of the sport, capturing the sights, sounds, traditions and superstitions that make fútbol more than just a game. Each frame illustrates the excitement that will soon captivate Russia and the world, depicting how "after four years of anticipation, this is how it should be lived." Set to the beat of popular song "Matador," the spot can be found here (and here with English subtitles). 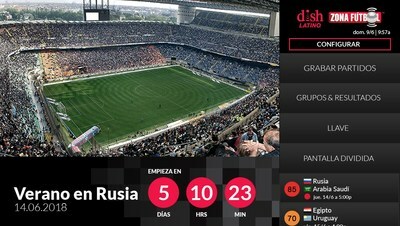 For more information on how DishLATINO is carrying and celebrating the tournament, visit https://www.dishlatino.com. DishLATINO is the market-leading suite of English and Spanish language programming packages in the United States. 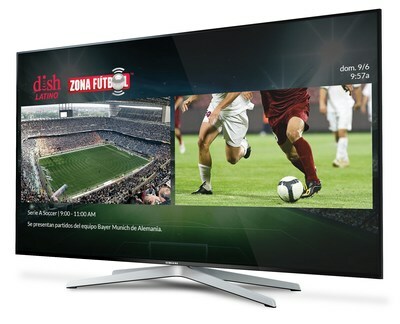 It offers its customers more than 40 Spanish-language news, entertainment, and sports channels in combination with DISH's broad English-language programming lineup of more than 200 channels. DishLATINO customers can receive the Hopper, the industry's most awarded DVR, and take advantage of in-language customer service as well as payment solutions including a no-term contract, prepaid pay-TV option.